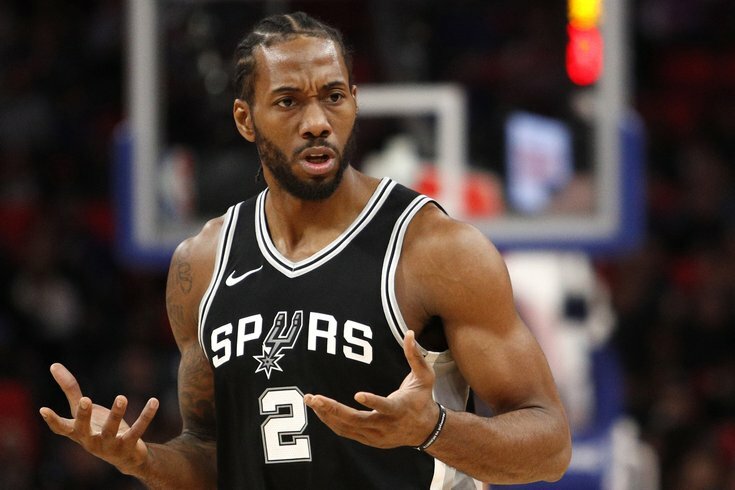 Should the Sixers go all in on San Antonio Spurs forward Kawhi Leonard? For about 12 hours on Sunday, Philadelphia was in a frenzy as word got out that the Sixers were meeting with LeBron James' representatives in Los Angeles. But, by the time the midsummer sun set across the region, it became clear the NBA's top free agent was not going to sign in Philly, opting instead for a four-year, $154 million deal with the Lakers. The ripple effect of James' deal — it's less like the result of throwing a stone in a pond and a lot more like the tsunami from "Deep Impact" — will be felt across the NBA landscape, and even more so with the Sixers, who have now seen themselves miss out on the top two free agents (James and Paul George, who re-signed in OKC). On Monday, they signed JJ Redick to a one-year deal at a much more reasonable price than what he cost them last season, but there's still a lot of work left to be done. And they have some cap space to make it happen. "How much would it cost?" seems to be the big question right now. But, to me, it's more about whether or not it's even worth it, especially for a rental player who basically sat out last season in protest because the team hadn't traded him yet. Now, all of the “star hunting” attention is turned to Leonard. If nothing else, James' early decision allows the Sixers to shift their focus elsewhere. Oh, and his departure from the Eastern Conference certainly helps open things up for the Sixers, who have the second-best odds in the East (behind the Celtics). Despite the historically low odds of coming out of free agency with a superstar from another team, free agency is not necessarily a fool’s game. By acquiring a player simply with cap space, it’s a super-valuable team-building tool given the low cost. It’s a high-risk, high-reward play. Teams too often overreact to failing to sign superstars. Too often, teams create cap space without having the future commitments or alternatives. It’s what results in situations such as the second most notable trade heist of the century; desperation (and, with it, “optics”) leads to rash decisions. The Sixers, all of a sudden flush with cash with no superstar talent to give it to, will need to avoid this. ... but still make him pay. What do you do when a star free agent picks another team over your own? And this moment should help to fuel the fire for [Ben Simmons, Joel Embiid, Markelle Fultz, Brett Brown, et al]. The Sixers sport two generational talents and loads of roster and salary flexibility. Yet, the best player in the world gave them a cursory glance before taking his crown and establishing another kingdom. It was the type of dismissal LeBron usually saves for chase-down blocks. The true cost of an acquisition often does not come into focus until well down the line. Say, when a team realizes the options it would have to upgrade its roster were it still in possession of the lottery pick it traded away the previous offseason. With reports out that LeBron informed those close to him on Saturday that he planned on signing in L.A., what was the purpose of the Sixers' meeting with his agent, Rich Paul, on Sunday afternoon? James' media ventures that include everything from product endorsements to running his own production company take place in Los Angeles. And who better to learn from and help position yourself for a life after hoops than Lakers president Magic Johnson? On top of that, L.A. has become base for the entire James family in recent years. The family has two homes in California and James' oldest son, LeBron James Jr., has long been rumored to be taking his own talents to basketball powerhouse Sierra Canyon High School in Chatsworth, California. Before he decided to go to the Lakers, James said he wanted to do what was best for his family. He hinted he was ready to leave the Cavaliers at the end of the 2017-18 season. "I have no idea at this point. The one thing that I've always done is consider my family, understanding especially where my boys are at this point in their age," the player told reporters after Game 4 of the NBA Finals.